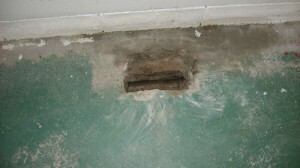 Your basement’s drain tile system allows water to flow away from your home and your foundation. This can prevent damage caused by prolonged exposure to moisture and seepage. Your drain tile system usually includes pipes with small perforations that lie atop a gravel bed. Channels and bleeders direct water from inside your foundation to the outside. If moisture is a consistent problem, a sump pump can be connected to your drain tile system to remove water from under your foundation on a continuing basis. Be sure to visit our Drain Tile Gallery to see pictures of this process. During the drain tile testing process, your Milwaukee waterproofing company will usually open a few holes to check the condition of your pipes, gravel bed and other components of your drain tile system. If blockages are discovered, these technicians will take steps to remediate the problem and to allow water to flow as intended through the drain tile system. Water flow testing may also be performed to determine if the exterior or interior drain tiles are in good working order. Working with a professional company can allow you to resolve any problems quickly and in the most cost-effective way possible. If problems exist in the drain tile system, it may be necessary to remove the old tiles and repair the system from bottom to top. This can sometimes eliminate issues with wet basements altogether. If leaks and problems persist, however, you may need a more comprehensive solution to your foundation problems. The foundation technicians at Accurate Basement Repair can provide you with the Milwaukee waterproofing services you need to enjoy the healthiest and most comfortable living conditions possible. These dedicated professionals work with you to determine the right approach to your basement and foundation issues and to provide you with the most accurate and effective solutions for your needs. By opting for the comprehensive basement and foundation services offered by Accurate Basement Repair, you can protect your investment while achieving greater peace of mind regarding your home’s foundation and basement. Call 414-744-6900 for more information. Posted in Uncategorized by Accu_Admin.